Knee arthroscopy, (or a “knee scope”) is one form of minimally invasive orthopedic services and sports medicine. Arthroscopic surgery of the knee is performed to both evaluate and treat certain knee conditions. The goal of arthroscopic knee surgery is to provide relief from severe knee pain caused by mechanical injury to or degeneration of the connective tissues and cartilage of the knee, and result in improved daily and athletic activities for the patient. Ideally, patients who have undergone arthroscopic surgery of the knee and have completed a proper course of rehabilitation should have a normal and active lifestyle without serious discomfort in the knee. Many types of knee injuries can now be definitively treated with knee arthroscopy, and, as a result, arthroscopic knee surgery is currently growing in popularity as the technology advances. 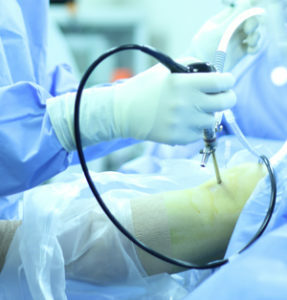 Arthroscopy is a minimally invasive surgical technique used by experienced orthopedic surgeons to treat mechanical injuries of the joint. Usually, two or three incisions are made into the area around the injured joint. The incisions, also known as portals, are only about six millimeters long (about a quarter of an inch). That may seem small but they only need to be big enough for small instruments to fit through during surgery. An instrument called an arthroscope (which, in Greek, means “to look at joints”) is inserted into one of those incisions. The arthroscope is a really interesting device. No longer than three to four millimeters in diameter (about an eighth of an inch), it has a very small fiber-optic camera bundled with a light, which provides video observation from inside of the joint. The video is displayed on a computer screen in the operating room, and the orthopedic surgeon uses this video feed to see inside the joint and perform surgery without having a direct open visualization of the joint. Thanks to the arthroscope, orthopedic surgeons can visualize the inner workings of patients’ joints in ways never before imagined. Small instruments (scissors, punchers, grabbers, etc.) are inserted at various times into the other incision(s). They are also very small. These instruments perform the actual trimming and repair work required to complete the surgery. The reasons our doctors often prefer arthroscopic surgery to tradition open surgery are numerous. First, there is, most often, a reduced recovery time. The minimally-invasive nature of arthroscopy means that surgeons need only make a few small incisions instead of one large incision. This leads to a second reason: less scarring. Smaller cuts lead to smaller surgical scars. Another positive factor of arthroscopic surgery is that it actually has an equal to or better success rate than traditional open surgery. Overall, far less trauma is caused by the body’s connective tissues in the area near the surgery during arthroscopic surgery when compared to open surgery, during which the joint must be completely opened up. By doing less damage while fixing the injury, the surgery is more likely to be successful, and less painful, one. Athletes and people who must keep active also benefit from the advantages of arthroscopic surgery. These people are more frequently injured than the general population, and they also are likely to need or want quicker recovery times to resume their preferred activities or job. Shorter recovery times and better outcomes both serve athletes and people with active lifestyles very well. Arthroscopic knee surgery is also an effective diagnostic tool. Using an arthroscope, our orthopedic surgeons can see a video feed of the inside of the knee joint. While other diagnostic tools merely provide snapshots of the joint, knee arthroscopy allows doctors to see real-time, and otherwise three-dimensional, video of the inside of the joint thanks to the camera on the arthroscope. The knee joint itself can also be moved during surgery to allow for a better view or to see how the inner workings of the knee joint react to movement. Arthroscopy can, at the same time, serve both as a confirmation of a diagnosis, and the definitive treatment as well. MRI and other imaging and diagnostic tests can only give us so much information. If a patient has had a lingering condition that has shown no response or improvement to non-invasive treatment, doing a diagnostic arthroscopy can both visually confirm the presence of a mechanical injury that was not discovered via imaging, as well as treat the injury at the same time of surgery. In some cases, imaging tests and examinations might prove inconclusive, and in those cases diagnostic arthroscopic surgery of the painful joint enables doctors to give patients a conclusive diagnosis and treatment at the same time. 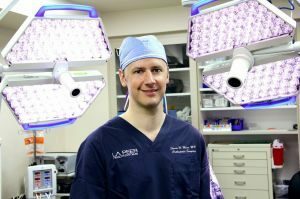 Dr. Steven Meier is one of the world’s foremost experts on advanced arthroscopic techniques. Both he and our support staff in the office and at our main surgery center are highly experienced in the field of arthroscopic knee surgery. We have the knowledge to ensure that your surgery with us will be a successful one. To learn more about knee surgery in Beverly Hills, visit medlineplus.gov for a more in details on minimally invasive knee surgery or contact us today at 310.736.2793 and schedule an appointment with an arthroscopic knee surgeon at Meier Orthopedic Sports and Regenerative Medicine. We will try to help you any way we can! Next, learn about Cartilage Damage.